In possession of a 24 hour park pass, I planned a full day’s hike. This wouldn't even begin to cover the huge Cradle Mountain and Lake St Clair (aka Leeawuleena, or "sleeping water") National Park, as it constitutes about a tenth of Tassie. Fine, that may perhaps be a slight exaggeration. But it’s big. The longest trail would've taken 6 days to cover, and stretches 65km long. But, having already established there wasn't a bus going anywhere that day, and with firm plans in place for my next Wwoofing venture in the west of Tassie, I only had one more night at the camp before moving on the next morning. After a minor hitch, involving the Australian banking system not allowing me to use my bank card for cashback from a teller, and with no cash machines available at any of the park stores whatsoever, which meant I was devoid of money, I set off on my trek. After all, no money changes hands in the wild. Apart from a few enterprising wombats selling grass to desperate naïve hippy backpackers. The first part of the trek involved a very steep climb 2/3 of the way up Cradle Mountain, catching me completely off my guard and unprepared. Glancing up, it was a do or die moment. Throwing caution to the wind, I grasped and sweated amateurishly, heaving myself up a near vertical rock face. At points, I didn't think I would manage it, but it would've been too embarrassing to admit defeat, shamefully making my way back down, avoiding crushing hands and heads of the other scaling trekkers. But once at the top, at Marion's lookout, ample compensation came as the magnificent vista of Dove Lake revealed itself. Sitting on a rock catching my breath, I began chatting to a German girl who happened to be my would-be dorm mate, as well as my next day's bus companion. Small rock indeed. We then parted ways as she was headed on another trek. Continuing towards the lake on my own, down a worryingly steep descent, I managed to yet again pioneer an original path - not a recommended attitude for the inexperienced hiker. 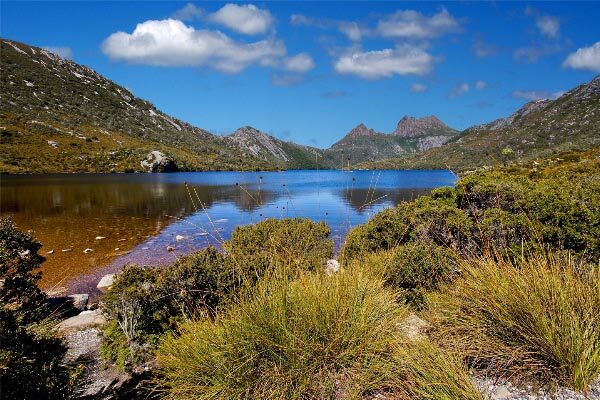 I slip-slid down to Dove Lake, where a convenient wooden boardwalk allowed for a much more accommodating and dignified walk for the casual hiker. 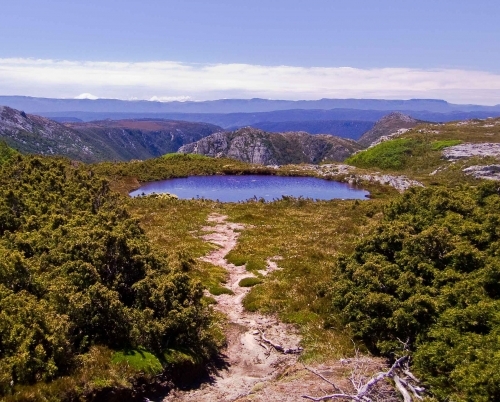 It was a beautiful sunny day - a rarity in rainy Tassie, and the lake was shimmering with light as I circled it. 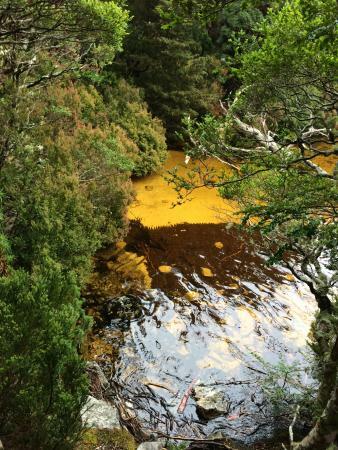 The water in the Tassie lakes and rivers is rust coloured, due to tannins in the typical button grass the wombats munch on, and also because of the tea trees that grow everywhere. The water is a bit like, well, tea! Feeling sun-kissed and smiley, I stopped to have my packed lunch in a beautiful secluded spot on the lake, took my shoes off and dipped my feet in the cool water. This was the first time on this trip I felt truly in the moment, light and clear of heart and mind. I doubt Kraft processed cheese and oat biscuits have ever tasted as delicious for anyone before, nor will again. I got back in time to have another quick walk to see the King Billy pine, a big deal tree in an ancient rainforest, taking the obligatory selfie next to it. I then returned to camp for a much needed shower - considering this was a campsite, the showers were incredible, each with overhead heating and a stall for clothes and delightfully hot, high pressure water – luxury. Yes, more to say about the shower than the ancient pine! Simple pleasures matter when you travel. Speaking of which, dinner involved some quick-cook pasta, and a glass of wine kindly shared by one of my dorm mates - a stocky medical scientist with a gruff no-nonsense way about her, which endeared her to me straight away. Having grown up on a farm up near Adelaide, she’d naturally seen quite a bit of hay action, she divulged. No doubt a city boy came to town and taught them all how to dance. Leaving the national park, I felt sad that I didn't take more time to trek around. 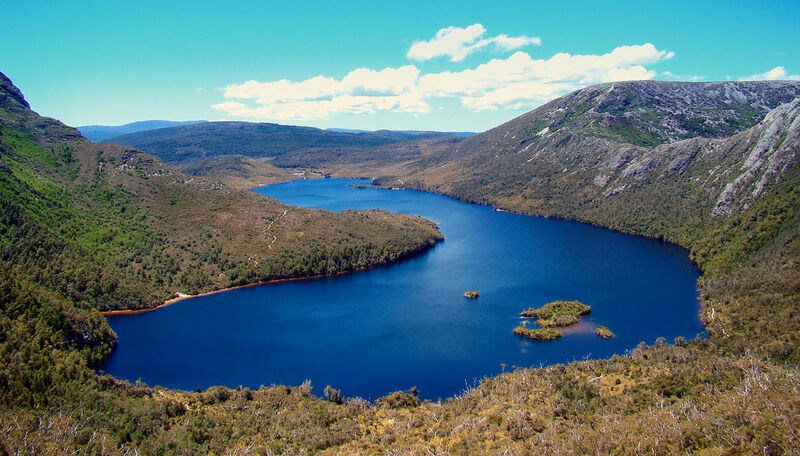 The whole length of Tasmania, I had heard from fellow travellers, can be hiked in a couple of weeks, and it seemed like something I would one day love to undertake. 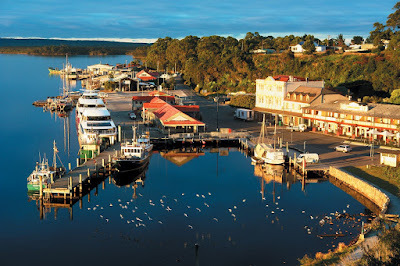 In the morning, my German dorm-mate and I got on the bus to Strahan, which snaked through a mass of increasingly green wilderness and a whole lot of absence of humans. Whatever "towns" we went through, such as they were, consisted of a milk bar and a community house of some description, with perhaps a few rickety houses. 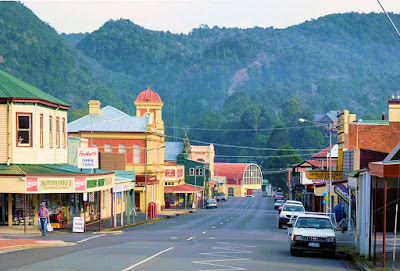 The two actual cities we drove through, Zeehan and Queenstown, looked straight out of a Spaghetti Western and I half expected a wagon to lazily creak past at any moment. But it didn't. In Queenstown, a gold and copper mining town, we stopped for lunch, and I wisely ordered deliciously sweet scallop fritters and chips, which would necessitate a definite repeat if I ever return. 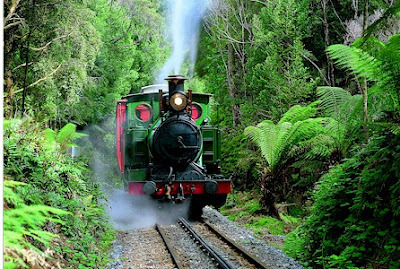 And the town may not have had a wagon, but it did indeed have a steam train, which tracks through the world heritage untouched rainforest conservation area, and was in the past used to carry the mining spoils through the rainforest, all the way to Strahan, my actual destination. 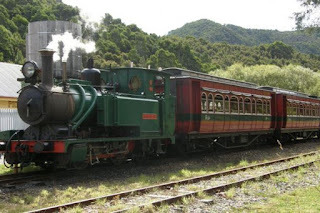 However, for us pauper travellers it was startlingly expensive to go on. So we opted to take a couple of photos of it rolling into the station instead. ﻿Leaving Queenstown, the driver picked up a gaggle of schoolchildren. My companion and I spent the rest of the journey checking for gum in our hair and sniffing the occasional suspicious burning smell. A small child asked to take my photo "for the next bus journey". I'm pretty sure the camera was angled towards my cleavage. Cheeky monkey. Then, just before the end of the journey, drama! A water bomb had "accidentally" been "dropped" by one of the kids, startling the elderly passengers and injecting extra oomph into the driver's gas-stepping foot. Thundering to our final stop, he stood up and gave an Oscar-worthy psychotically angry finger-wagging performance, featuring such gems as 'who's gonna clean this mess eh?!' and the all-time favourite 'this is your last warning!'. The seemingly shamefaced pupils got off the bus, then proceeded to make obscene gestures upon exit. The driver turned to us couple of passengers left and asked if we thought he'd scared them. I confidently assured him he did not. My next Wwoofing hosts were a couple, based in a quiet suburban house in Strahan - an inaccurate description really, as the whole town is a sort of suburb. Located on the Tassie west coast, harbour access from the ocean is via Hells Gates, so named not just because of their tiny near impossible proportions, which caused quite a few ships (and a whale, apparently) serious navigational kerfuffle, but also as a reminder of the notorious Sarah Island situated just within them. Here, convicts were taken in the early 1800s to build ships in the baking heat, or just be locked up in the small penitentiary. Little did they know that the hardships they endured were only small-scale compared with the conditions on Port Arthur down in the south west, where the worst of the bunch would eventually end up. In fact, according to my trusty guides, Sarah Island gradually turned into a resort-like camp, which some of the prisoners were reluctant to leave. My hosts sent their other Wwoofer to pick me up, and I stood looking out to the harbour waiting for him. All I knew was that his name was Leo.